Your pressure washer is different from most other water pumps because it’s a positive displacement pump, designed to produce the same flow each time its drive shaft rotates. You can change the discharge pressure of your pressure washer but not the flow, for reasons we’ll explain below. To understand how a pressure washer pump works, consider another example of a positive displacement pump: a toy water pistol. Like your pressure washer, a water pistol produces the same volume for every cycle – a squeeze and release of its trigger. If you squeeze the trigger twice as frequently you’ll get twice the flow. 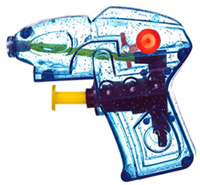 Block the barrel of the water pistol with your finger and you’ll feel the added force when you try to squeeze the trigger. Continue to block the barrel as you squeeze the trigger and you’ll break the toy. Fortunately your pressure washer has an unloader valve that shuts off the flow of water whenever the discharge pressure exceeds the rating of your machine. Without this valve your unit would stall or burst when you release the trigger of your spray wand and block the flow of water. Since your pressure washer pump is driven by an engine or motor that maintains a nearly constant speed, the flow from the pump stays virtually the same regardless of the size of nozzle and resulting discharge pressure. You’ll get different pressures for different nozzle sizes but the unit will always produce its rated GPM volume – or none at all if the unloader valve is engaged. For this reason, choosing a nozzle with a larger orifice will lower the discharge pressure and reduce the cleaning force at the tip, but it won’t change the GPM flow of your machine. How does this impact the design of a sewer jetter? It means that for maximum cleaning and pulling power you should choose a combination of jetter hose and nozzle that produces close to the PSI pressure rating of your machine at its rated GPM flow. For more sewer jetter sizing tips see our articles about choosing the right jetter nozzle and choosing the right jetter hose.